Studs Terkel is living a rich life which few can match. I think in a way he is an embodiment of Alvin Toffler’s Cognitariat. Studs is an unapologetic intellectual who belongs to the working class. His business is information, innovation and the human spirit. According to Toffler, knowledge is the ultimate power. It has the highest quality, the most flexibility and in a sense is inexhaustible. If this is true, than Studs is the irreplaceable, autonomous employee. Mr. Terkel is an author. His two finest books, in my opinion, are The Good War: An Oral History of World War II and Hard Times: An Oral History of the Great Depression. As the titles imply, he is a great talker and better listener. 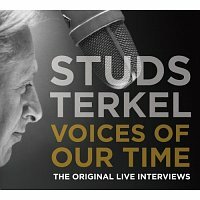 Nowhere is this more evident than in the 6 CD collection Studs Terkel, Voices of Our Time:The Original Live Interviews. His books are based on thousands of interviews with ordinary Americans who survived extraordinary times. The Voices of Our Times collection spans four decades of conversation which Studs recorded with the great thinkers of their day. The list includes: Gore Vidal, James Baldwin, Mel Brooks, Maya Angelou, Dr. Oliver Sacks and Laurie Anderson to name just a handful. For me, the hidden joy of this collection was the opportunity to listen to some of the less famous talents from America’s past. Each new individual becomes a jumping off point for further research and exploration, a chance to connect more of the dots. It’s what learning is all about. Previous Previous post: Crank it up……..
Next Next post: Science Verse…….